Editor’s Note: This entry is republished from the Historical Files maintained by the National Park Service and there are numerous references to houses where the Bloomers lived and that today are maintained by the NPS as historic sites. Introduction: Amelia Jenks Bloomer (May 27, 1818 – December 30, 1894). 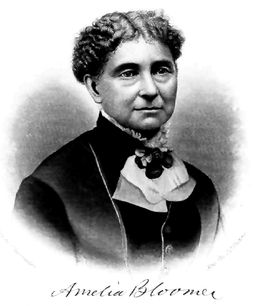 During the 1840s and early 1850s, Amelia Bloomer was one of the most well-known reformers in Seneca Falls, New York. An indefatigable worker, she became involved in temperance work, women’s rights, dress reform, religious charities, and numerous other humanitarian movements. She was very early identified as a believer in women’s rights, and gave that cause heavy coverage in the pages of her newspaper The Lily. Her courage in her convictions, and her willingness to act on them made her a highly visible figure among early women’s rights advocates. Even though she did not create the women’s clothing reform style known as “bloomers,” her name became associated with it because of her early and strong advocacy. Early Life: Amelia Jenks Bloomer was born May 27, 1818 in Homer, New York. She was raised in a family of modest means and received only a few years of formal education in the local district school. After a brief stint as a school teacher at the age of 17, she decided to relocate, and moved in with her newly married sister Elvira, then living in Waterloo. Within a year she had moved into the home of the Oren Chamberlain family to act as the live-in governess for their three youngest children. Amelia Bloomer, too, threw herself into local activities, particularly church charities and local temperance societies. In 1840-1841, a vigorous and highly emotional campaign against alcohol abuse swept across the country under the aegis of the Washington Temperance Society. The Washingtonians had been founded by six Baltimore friends who one night had suddenly decided to swear off alcohol completely and to devote their lives to convincing others to do the same. The Six Reformed Drunkards, as they were forever after called, travelled throughout the country presenting lectures against the evils of alcohol which matched those of a revival preacher for passionate fervor and frightful imagery. Vast numbers of people were convinced by their oratory, and signed Total Abstinence Pledges by the thousands. Like the Abolitionist Movement, the Temperance Movement played a vital role in the development of the women’s rights cause. Many of the central figures in the women’s movement such as Susan B. Anthony, first became involved in reform activities through temperance societies. Their participation in these groups would begin to bring home to them the peculiarly demeaning position of women in all fields of endeavor. When the temperance agitation first began, women were applauded for organizing their own Martha Washington Societies as adjuncts to the men’s Washington Temperance Societies. Indeed, many felt that women were particularly well-suited for temperance work, as popular wisdom ascribed to them superior powers of moral persuasion and spirituality. The article by Amelia Bloomer quoted above shows how she too felt that women had a unique responsibility to reform and ennoble those around them. Nineteenth century temperance literature almost never addressed the issue of female intemperance. It was always simply assumed that women were morally better than men by nature, and that their refined sensibilities made them the obvious regenerators of degraded mankind. Many women were attracted to the temperance movement not so much to rescue fallen men, as to protect themselves. Under the current legal and social systems, women often became the innocent victims of drunken or dissolute husbands. Unable to earn a living or own property, they were totally dependent on the head of the house for their livelihood and support. The temperance papers of the day were full of stories of women physically abused or neglected by drunken fathers or husbands. Bloomer remained the sole editor and owner of The Lily for the next 15 years, molding it into one of the most influential and liberal publications dealing with women’s issues in the early 19th century. It became a major forum for the writings of Elizabeth Cady Stanton, and an outspoken advocate of women’s rights. Much of the credit for the political feminization of The Lily must go to Elizabeth Cady Stanton. Although Bloomer had always held deep convictions regarding the rights of women, it was not until she came into contact with Stanton that these unconnected feelings and general beliefs solidified into a formal philosophy on women’s rights. Because she was out of town on the days of the Convention, Bloomer said that she was able to attend only the last evening’s session. She implied that if she had been in Seneca Falls she would have been present at all the sessions. According to her husband, she “had not yet thought much on the subject of women’s rights . . . [and] took no part in its proceedings,”  nor did she sign the Declaration of Sentiments. The little that she had heard apparently had an effect on her for it was only one month later that she first made the revolutionary suggestion that the Ladies Temperance Society publish their own newspaper. 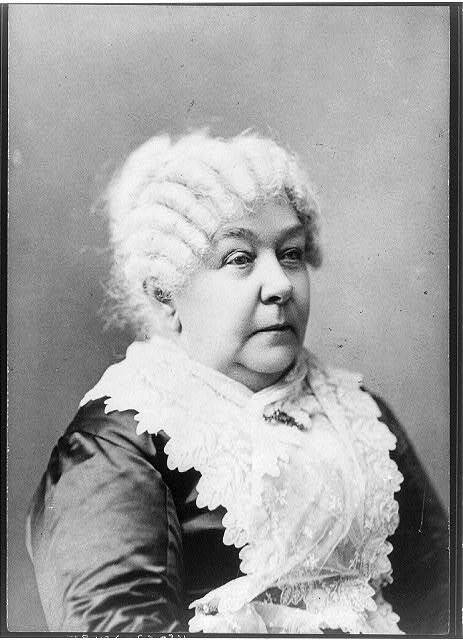 Ever ready to recognize a favorable opportunity when she saw one, Elizabeth Cady Stanton considered the new The Lily to be a prime candidate for the dissemination of feminist views. With its woman editor, advanced views, and reform orientation, it seemed natural that the little temperance paper should expand its columns to the discussion of women’s rights as well. Amelia Bloomer’s own actions and attitude no doubt encouraged her to believe that the editor would be open to the suggestion. It was in this little lounge that Dexter Bloomer says that Elizabeth Cady Stanton first introduced herself to his wife in the summer of 1849. Stanton offered to contribute some articles for The Lily, the first one appearing in the November 1849 issue under the pseudonym “Gloriana.”  This and subsequent articles dealt with temperance issues, but Stanton gradually began submitting articles on women’s rights, suffrage, child rearing and other related subjects, usually under the name “Sunflower.” The Lily began to assume a much broader scope, due in large part to Stanton’s frequent contributions to the paper. That collective “we” would no doubt have surprised Bloomer, as according to her testimony, Elizabeth Cady Stanton had absolutely nothing to do with the founding of The Lily, and had not even had an article printed in it yet when she wrote her letter to Pierpont. As is generally the case in any dispute involving two very strong characters, the truth of the matter probably lies somewhere between. To Amelia Bloomer must certainly go the sole credit for first conceiving of a paper to be written and managed by women, a courageous undertaking in itself, no matter what its particular orientation might be. It must also be acknowledged that Elizabeth Cady Stanton probably did strongly influence Bloomer in the development of her subsequent feminist philosophy. Though Bloomer had been resolutely living out her convictions in her own life, it was almost certainly Stanton who opened her eyes to the wider issues and the possibilities of using The Lily as a woman’s forum. Though Stanton and Bloomer seemingly maintained a cordial friendship and correspondence throughout their lives, there were fundamental differences in their views of women’s rights that created some friction between them. Elizabeth Cady Stanton was much more universal and humanistic in her approach than Amelia Bloomer, whose ideas were always firmly anchored in the tenets of traditional Christianity. She had joined the Seneca Falls Episcopal Church along with her husband in 1843, and remained a zealous and active church woman all of her life. Stanton was often frustrated by Bloomer’s refusal to condemn the church in The Lily for its unenlightened views on women and other reforms,  but Bloomer believed in effecting reform within the framework of Christianity and would not attack the religious establishment, one of Stanton’s favorite targets. Bloomer related how they once had a little “difference of opinion in regard to changing the constitution of the Women’s State Temperance Society, so that men would have equal rights therein. I did not favor this change when it was brought before the convention in 1853. Mrs. Stanton said ‘a’ but I did not say ‘b.’ She may have felt a little cool towards me over it.”  Comments they made about each other in letters to friends seem to indicate that there was a subtle sense of rivalry between the two women, each trying to outdo the other as Seneca Falls’ resident feminist and foremost reformer. With a firm belief in the righteousness of her various causes, Amelia Bloomer set about reforming Seneca Falls the day she arrived. (She gave an impromptu temperance lecture at her wedding reception at the Fullers.) With her determined character and energetic habits, she was no doubt a familiar figure about the village. Until Elizabeth Cady Stanton arrived and began seriously lobbying for women’s rights, Seneca Falls’ female editor and postmistress was probably the most visible, if not tolerant, example of a women’s advocate in town. Stanton soon supplanted her as the main figure in the women’s cause after the 1848 Convention, creating the slight delicacy of feeling which apparently existed between the two women at times. Amelia Bloomer felt that she was providing the better practical example of women’s equality through her work at the post office and The Lily, while Elizabeth Cady Stanton felt that her work to develop a network and philosophy for the movement was ultimately more significant. One issue on which both women agreed and with which Amelia Bloomer’s name has been indelibly linked, was that of dress reform. Although the topic was the subject of ridicule, dress reform for women was a serious issue in the 19th century. For many women, the then prevailing fashion of tight corsets, trailing skirts, and layers of petticoats was both a symbol of women’s degradation and a positive health hazard. Even the staunchest women’s rights advocate had to admit that it was foolish to argue for the right to follow any profession they wished, when the clothes they were wearing would have prevented them from performing the very jobs they were seeking. Except among some patients at isolated water cures, and a few daring bohemians, little had really been done to try to popularize dress reform in the early 19th century, and the phenomenal Bloomer Movement of the 1850s was more an accident than any preplanned strategy on the part of Amelia Bloomer. The Bloomers remained in Ohio for two years where Amelia continued to publish The Lily, as well as provide editorial assistance to her husband’s paper. The Lily by this time had fully adopted a woman’s rights orientation, and Bloomer continued an aggressive campaign for the vote, equal educational opportunities, and alterations in the inheritance laws in its columns. She employed a vigorous and uncompromising writing style which left no doubt as to her views on these and other related subjects. After retiring from public life and coming to this land of strangers where I was to commence life anew and make new friends, I felt at times like donning long skirts when I went into society, at parties, etc., and did so. I found the high winds which prevail here much of the time played sad work with short skirts when I went out, and I was greatly annoyed and mortified by having my skirts turned over my head and shoulders on the streets. Yet I persevered and kept on the dress nearly all the time till after the introduction of hoops. Finding them light and pleasant to wear and doing away with the necessity for heavy underskirts (which was my greatest objection to long dresses), and finding it very inconvenient as well as expensive keeping up two wardrobes—a long and short—I gradually left off the short dress . . . . 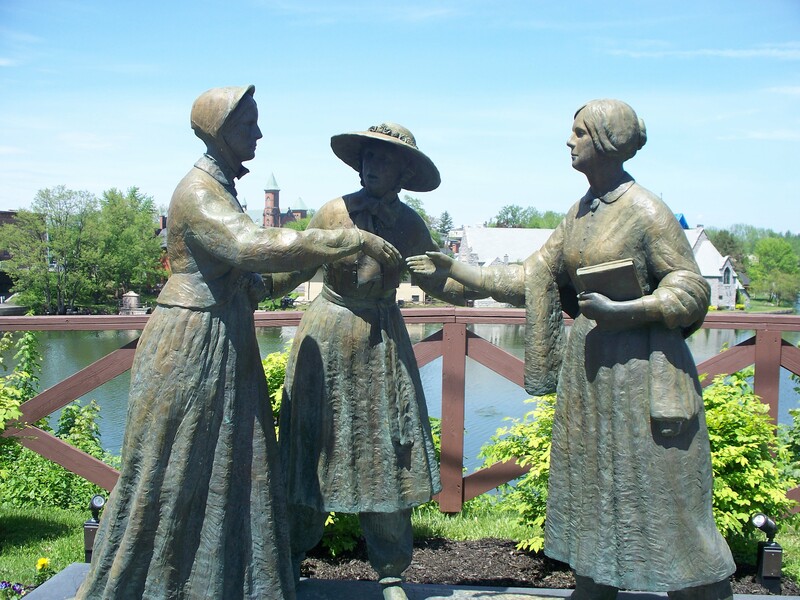 Along with Elizabeth Cady Stanton, Amelia Bloomer is Seneca Falls’ most acknowledged women’s rights advocate. It was through the columns of The Lily that many women first realized that there was indeed something inherently wrong in their position by custom and law. Bloomer provided an open, comfortable forum through which women could express and share their views, an opportunity not offered by the regular journals of the day. Without The Lily to act as their voice, the early women’s rights supporters would have had no way to regularly publicize and analyze their developing philosophy and concerns. Amelia Bloomer’s life is also an important case history of how many women became involved in the women’s rights movement through earlier connections with antislavery or temperance causes. Almost every major figure in the movement began his or her career associated with the “acceptable” reform societies involving temperance or slavery. As the women began to see that they were not to be allowed to contribute to these causes as they wished, they began to realize that their position in society would make it impossible for them ever to utilize their full potential. Until their rights as women were secured, they were powerless to right the wrongs of others. Amelia Bloomer experienced this very process. Becoming interested in temperance work as a pious church woman, she soon grew impatient with the limited role she was allowed to play and took matters into her own hands with the publication of The Lily. Her increasing militancy on the women’s issue was simply the natural outgrowth of her thwarted attempts to effect change in other reform areas. This process repeated itself again and again with other individuals, thereby creating the resolute core of leaders who led the women’s rights movement through its earliest years. Amelia Bloomer is commemorated together with Elizabeth Cady Stanton, Sojourner Truth and Harriet Ross Tubman in the calendar of saints of the Episcopal Church on July 20. Her home at Seneca Falls, New York, known as the Amlia Bloomer House, was listed on the National Register of Historic Places in 1980. 1. The Life and Writings of Amelia Bloomer, Dexter C. Bloomer (Boston, 1895). This remains the best source of information on Bloomer, containing many quotes from her letters, speeches and editorials. 2. The Lily—The Seneca Falls Historical Society has a partial run available on microfilm. There is a complete run of all issues available at the Bird Library at Syracuse University. 3. Amelia Bloomer Collection—Seneca Falls Historical Society. In addition to the original manuscripts of some of Amelia Bloomer’s lectures, this collection contains a fair bit of information on her life in Iowa. There is little direct information from the Seneca Falls time period, but the later material does provide some clues as to Bloomer’s character and interests. 4. Bloomer’s Lily by Maria Temechko. A paper prepared in 1972 for the Seneca Falls Historical Society. A good short history of The Lily and the various causes it supported. 5. “The Lily—An Interpretation” by Warren N. Paul. A paper prepared for the State University of New York at Oswego. Copy at the Seneca Falls Historical Society. An examination of the development of the women’s rights orientation in The Lily. 1. Bloomer, Life and Writings, pp. 11-2. 3. Bloomer, Life and Writings, p. 13. 6. Typescript copy of a letter from Amelia Bloomer to Isaac Fuller, dated March 1, 1862, Amelia Bloomer Papers, Seneca Falls Historical Society. 7. Bloomer, Life and Writings, pp. 17-8. 9. Caroline E. Lester, “Mrs. Bloomer and Mrs. Stanton in Seneca Falls,” Seneca Falls Historical Society Papers, Centennial Volume, 1948, p. 130. 10. Edgar L. Welch, “Grip’s” Historical Souvenir of Seneca Falls, New York (Syracuse, 1904), p. 31. 11. Assessment Rolls – 1851, Seneca Falls Historical Society, Archival Collection, #29. 12. Bloomer, Life and Writings, p. 17. 13. Welch, “Grip’s”, p. 61-2. 14. The Water Bucket, July 15, 1842. 15. Bull, “Woman’s Rights,” p. 43. 16. Bloomer, Life and Writing, p. 21. 17. The Water Bucket, February 25, 1842. 18. Bloomer, Life and Writings, pp. 22-3. 19. Bull, “Woman’s Rights,” p. 44. 20. Bloomer, Life and Witings, pp. 39-40. 21. Seneca Falls Revielle, July 30, 1880. 22. Free Soil Union, August 8, 1848. 23. Bloomer, Life and Writings, p. 41. 26. Warren N. Paul, “The Lily – An Interpretation,” unpublished typescript at the Seneca Falls Historical Society, pp. 8-9. 27. Bull, “Woman’s Rights,” pp. 53-4. 28. Seneca Falls Revielle, July 30, 1880. 30. Bloomer, Life and Writings, pp. 34-5. 31. Bloomer, Life and Writings, p. 48. 32. Stanton, Eighty Years, p. 200. 33. Bloomer, Life and Writings, p. 46. 34. The Lily, November 1, 1849. 35. Stanton and Blatch, Elizabeth Cady Stanton, pp. 38-9. 37. Bull, Woman’s Rights, pp. 53-4. 38. Seneca Falls Revielle, July 30, 1880. 39. Bloomer, Life and Writings, p. 26. 40. Stanton and Blatch, Elizabeth Cady Stanton, p. 39. 41. Seneca Falls Revielle, July 30, 1880. 42. James, et al., Notable American Women, Vol. I, p. 181. 43. 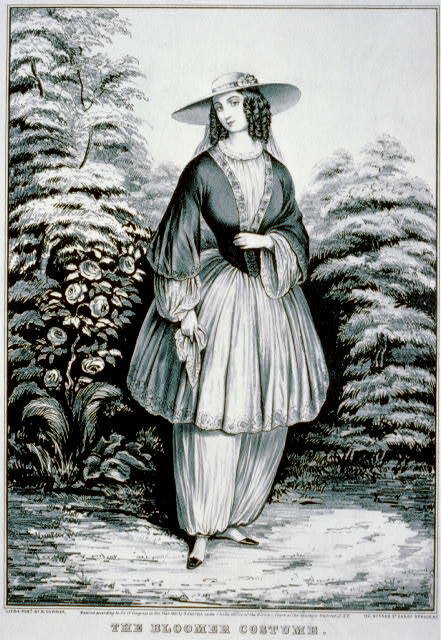 Mary Curtis, “Amelia Bloomer’s Curious Costume,” American History Illustrated, (June 1978), p. 15. 44. Bull, “Woman’s Rights,” p. 52. 45. Marie Irvine Hoover, “Mrs. Amelia Bloomer and My Early Recollections,” unpublished typescript in the Amelia Bloomer Papers at the Seneca Falls Historical Society. 46. Bloomer, Life and Writings, p. 16. 47. Stanton, Eighty Years, p. 201. 49. Bloomer, Life and Writings, p. 67. 50. Bull, “Woman’s Rights,” p. 52. 52. Maria Temechko, “Bloomer’s Lily” (1972) unpublished typescript in the Amelia Bloomer Papers at the Seneca Falls Historical Society, p. 12. 53. Bloomer, Life and Writings, pp. 67-8. 55. Bull, “Woman’s Rights,” p. 56. 56. Seneca Falls Revielle, July 30, 1880. 57. Elizabeth Cady Stanton to Amelia Opie, September 30, 1851, Elizabeth Cady Stanton Papers, Library of Congress. 58. Bloomer, Life and Writings, p. 85. 61. James, et al., Notable American Women, p. 180. 62. Bloomer, Life and Writings, p. 145. 64. James, et al., Notable American Women, p. 180. 65. Ibid. Paul, “The Lily,” p. 1. Temechko, “Bloomer’s Lily,” p. 17. 66. James, et al., Notable American Women, p. 181. 67. Bloomer, Life and Writings, pp. 72-3. 68. James, et al., Notable American Women, pp. 179, 181. I visited Gerrit Smith’s home this past summer. This is a wonderful article and a fantastic connection.